Dr. Erin Garman received her DVM in 1992 from Iowa State University and came to Linn Animal Hospital in 1998 after practicing in Des Moines for four years and in Madison for two years. She became a partner of Linn Animal Hospital in 1999 when Dr. Vic Klopfenstein retired. Dr. Garman has a special interest in ultrasound and has been performing cardiac and abdominal ultrasounds since 2000. She also enjoys internal medicine and soft tissue surgery, along with her ferret patients and their unique challenges. She is a member of the AVMA, IVMA and LCVMA, in addition to being a member of the Ethics Committee for the IVMA. Dr. Garman is a 1985 graduate of Cedar Rapids Kennedy High School. Her family life is spent on an acreage with her husband, Bob, and their three children. Her animals: Arthur Louis, a Llewellyn Setter, cats Sun and Denis, and a guinea pig, "Squirrel," round out the family. She enjoys the beach, water sports, and entertaining with her family and friends. Dr. Greg Winterowd is a native of Linn County and a second generation veterinarian. After graduating from Springville High School, Dr. Winterowd received his BS in biology and chemistry from Cornell College in Mount Vernon. He received his DVM from Iowa State University in 1994. Dr. Winterowd worked with his father, Darrell, in Cedar Rapids from 1994-2000, and then came to Linn Animal Hospital via their sister clinic, Park Towne Animal Hospital, where he is now a partner. Dr. Winterowd is a member of the AVMA, IVMA, and past president of the LCVMA. Dr. Winterowd has always been focused on small animal medicine and enjoys orthopedic and soft tissue surgery. Recently, he has been studying the benefits of herbal remedies as an adjunct treatment to traditional medicine. Dr. Winterowd sits on the Linn County Animal Control Task Force and works with the Cedar Rapids Animal Control and their neuter program. Dr. Winterowd, his wife, and two daughters live on a small hobby farm with a dozen black angus cattle, a handful of barn cats, and an old llama named Brownie. Dr. Winterowd is rarely seen at work without one of his dogs close by. He enjoys racquetball, construction, and driving his old dump truck in his spare time. Dr. Jill Johnson received her DVM in 1994 from Texas A&M University and joined a large animal practice in Houston. She moved back to Iowa in 2002 and joined Linn Animal Hospital and their sister clinic, Park Towne Animal Hospital, in 2004. Dr. Johnson's special interests are internal medicine and soft tissue surgery. A certified veterinary chiropractitoner, she uses spinal adjustment as a complimentary modality in the treatment of neck and back problems. She is a member of the AVMA, IVMA, and LCVMA. Dr. Johnson graduated from Cedar Rapids Prairie High School in 1980. She lives in Cedar Rapids with Jack, her adopted dog. She enjoys outdoor activities, especially running, biking and fishing. 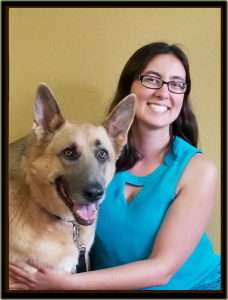 Dr. Misty Yancey received her DVM in 2015 from Kansas State University. Prior to her appointment at Linn Animal Hospital and Park Towne Animal Hospital in 2017, Dr Yancey served as associate veterinarian at a progressive 24-hour emergency hospital in a Northwest Chicago suburb and a small animal clinic in Coralville. Her professional interests include preventative medicine, internal medicine, behavior and exotics. She is a member of the AVMA, IVMA and LCVMA. A native Kansan, Dr. Yancey moved to Florida to pursue a bachelor's degree in marine science from Eckerd College. Upon receiving her bachelor's degree, she spent several years in Florida working as a zookeeper and aquarist before returning home to attend veterinary school at Kansas State University. At home she enjoys spending time with her husband, Ben, and her pets. Her pets include a tabby cat named Jill, a coonhound mix named JImmy and a rescued German Shepherd named Nyla and numerous saltwater fish. Her hobbies include walking the dogs, baking, yoga, crochet, and painting.